Snowy Owl. Photo by Mary Brenner. 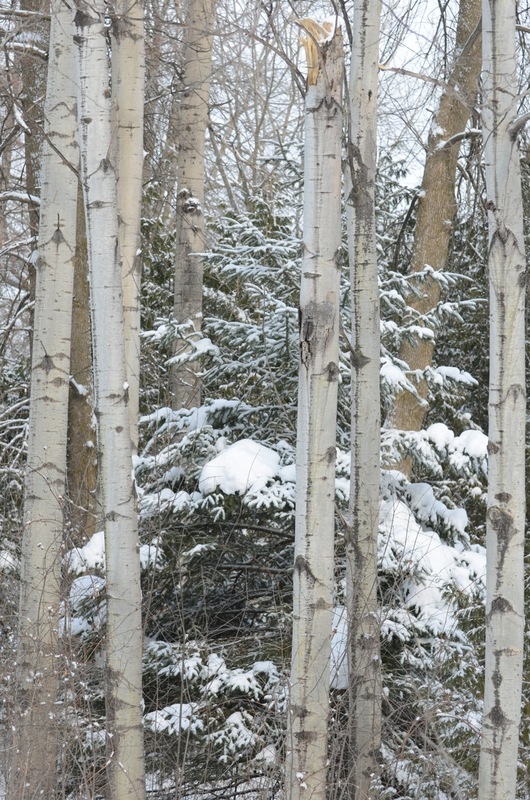 One snowy, cold, dark night, as I was sitting by my fire waiting for spring, I read an email about a birding trip. The Pennsylvania Society of Ornithologists (PSO) were going to Ontario, Canada to look for winter finches, owls, and a gyrfalcon. I did not hesitate to sign up to go. I have been missing the adventures of travel and birding these past months, with the passing of my dear husband, my travel and birding partner. I have had to figure out what is next for me in my life. Well, I was going to return to Canada where we had gone two years prior and found two Great Gray Owls! Led by Wayne Laubsher from PSO, four snow covered cars made their way north. Our first destination was Amherst Island after a ferry ride through ice. We were pointed to the location of a Snowy Owl on the ice as we moved steadily across the water. Along the shore there was a coyote stalking the same bird! Once on shore, we followed the road that circled the island. 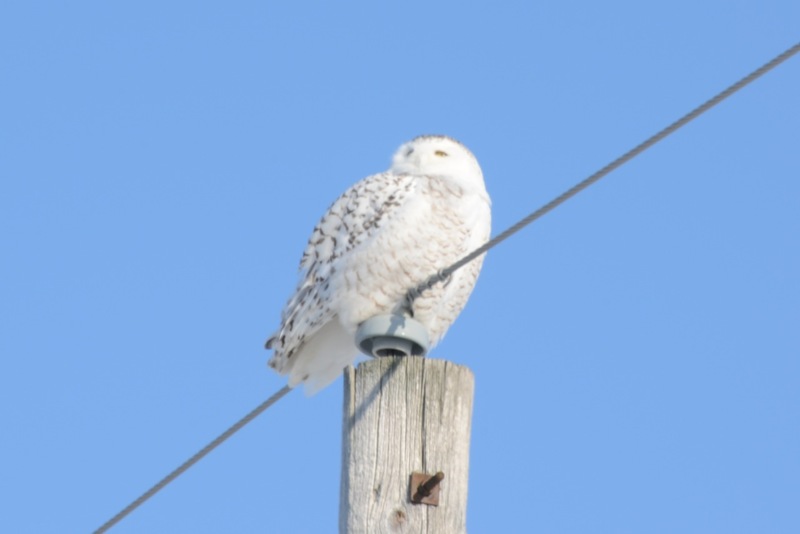 Ten Snowy Owls, ten Rough-legged Hawks, a Bald Eagle were among the birds we saw. This island is famous for an area called Owl Woods. On this day the snow was too deep to walk into the woods but views from the road were excellent. Amherst Island. Photo by Mary Brenner. The next morning, after we cleaned the snow from our cars, we made our way to the Lafleche Landfill to look for the gyrfalcon. We saw slippery roads, snowy skies and white and gray hawk. Finally, the Ravens and gulls began to move over the landfill, and a large gray bird trailed them looking for lunch. The gyrfalcon is a life bird for me. It was the first time I have ever seen this species, and I was looking through my husband’s binoculars. Did I mention the average temperature in Ontario during our stay was -22 degrees? We made quite a few stops in Ottawa, checking the river (Ottawa River) for Ducks and Goldeneyes and stopping at Ebird locations for Black-backed or Three-toed woodpeckers. No luck. So we continued towards Algonquin Provincial Park stopping for dinner at the Mad Musher for a late dinner. Algonquin Provincial Park visitor center. Photo by Mary Brenner. Huntsville, Ontario is on the western entrance to Algonquin. We woke to -47 degrees. We started our cars. One had a flat tire, and that car went off to Walmart to meet us later. We were instructed to not use our power windows as they might not go back up in this weather. We checked our windshield wiper fluid, a necessity, and filled them with a special mixture that is useful with this cold weather. The main visitor center in the park has feeders and a balcony for birdwatchers. 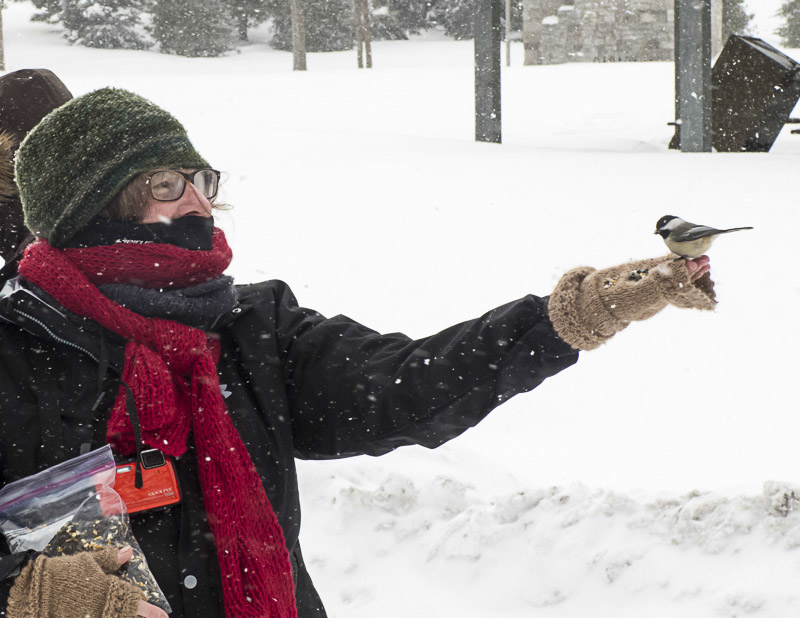 The Great Backyard Bird Count (GBBC), a citizen science project in North America, was held during our time here and the bird list was available for us to read which birds had been seen that day. Hoary and Common Redpolls, Ruffed Grouse, Chickadees were among the birds at the feeders. 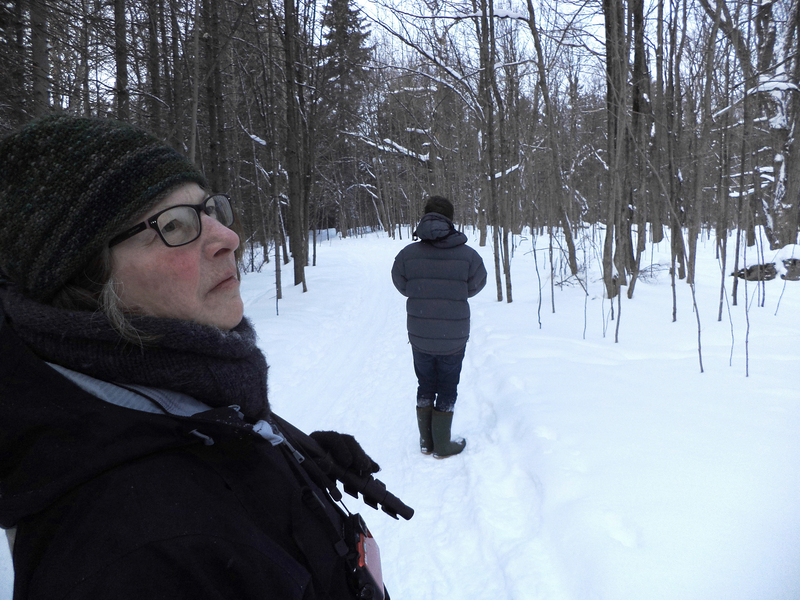 A short ride to The Spruce Bog area and a quiet walk through the evergreens led us to the suet feeders. 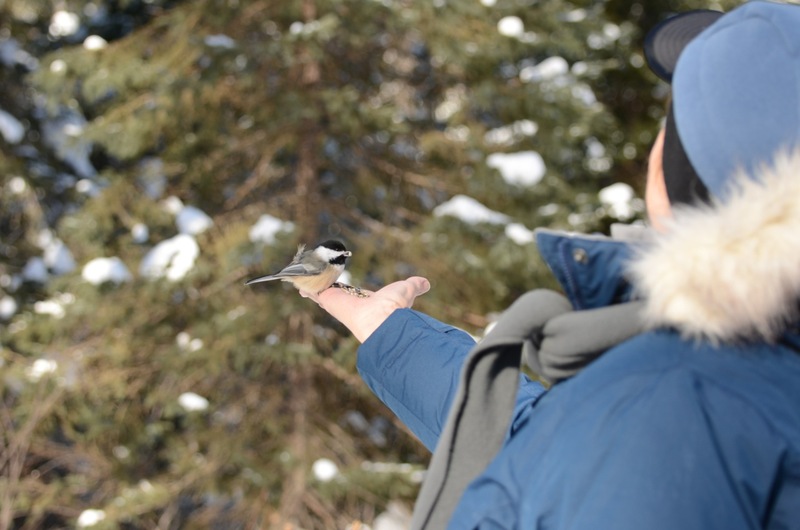 Black-capped and Boreal Chickadees flitted among the trees and landed in outstretched hands filled with birdseed. We came prepared. What a delight! We also were enchanted by the Red and White breasted Nuthatches. Meanwhile behind us on the path quietly Canadian families came walking and skiing by us. 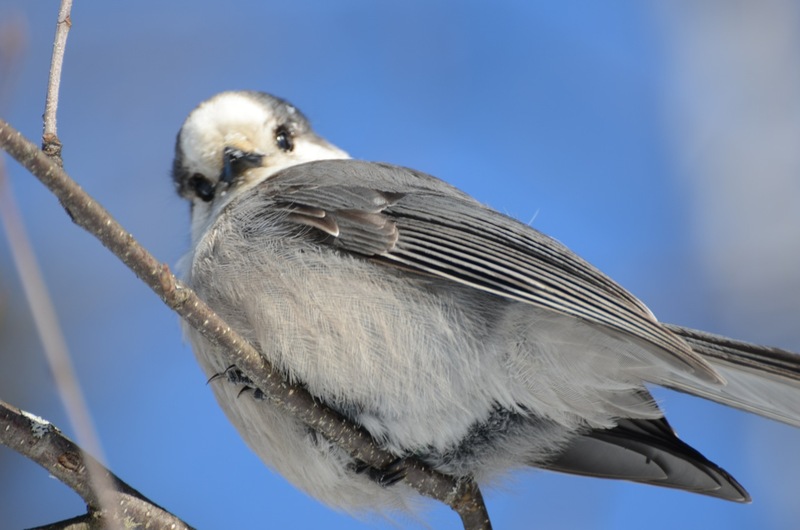 Another area was a haven for sweet, sweet Gray Jays. We heard they liked Tim Horton bagels but they seemed to enjoy some cheese crackers as well as the birdseed. Magic filled the air as all sixteen birders took turns offering seed to these Jays that must be the quiet black sheep of the Jay family. Boreal feeding. Photo by Mary Brenner. Gray Jay. Photo by Mary Brenner. 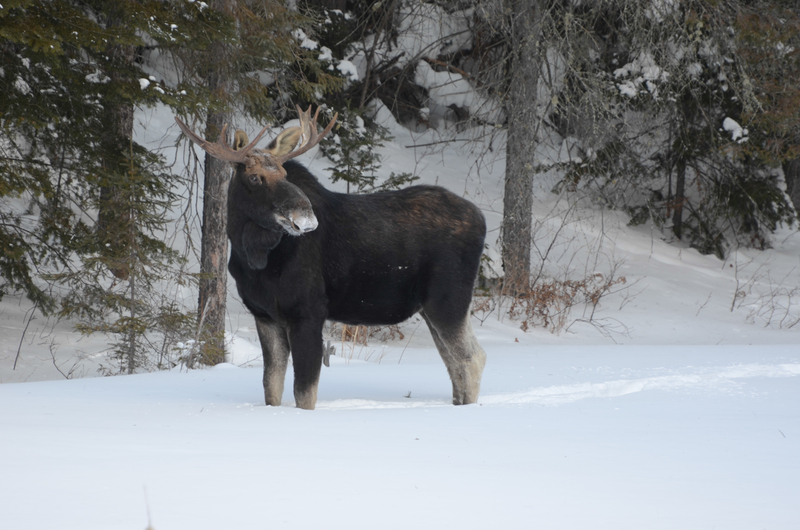 All cars stopped quickly at the sight of a huge bull moose. Luckily for him all we were shooting with was cameras. Bull moose. Photo by Mary Brenner. We continued back to Ottawa and returned to Ebird locations. We were rewarded with hundreds of Bohemian Waxings, a single Robin, and a Three-toed Woodpecker. These birds were seen in a wooded neighborhood with the help of local man who had seen the Woodpecker earlier in the day. 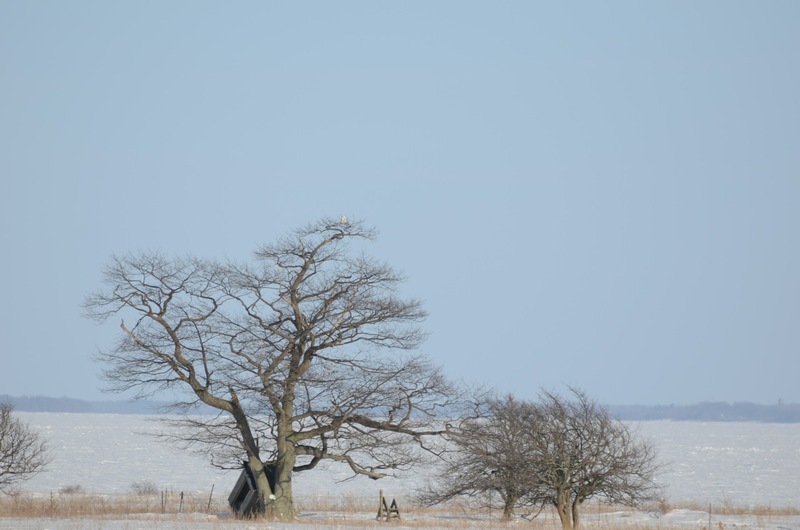 One last Snowy Owl flew across the road as we started south homeward bound.